It’s a brand New Year…Again | Damian Trasler's Secret Blog - Do Not Read! My actual white board, now no longer actually white. “Omar Serif” and “They’re taking the robots to Alderaan” are jokes I haven’t gotten around to yet. Be relieved about that. It’s nearly the end of the first week of January, and this is the first post I’ve managed in 2015, which means I ought to be talking about Resolutions. But, as you may know from last year, I don’t do so well with resolving to change. I need a list every day just to get through the things that keep the house running, so adding grand aspirations to that list has been somewhat problematic in the past. However, last year, I decided to just write more stuff. This was a simple enough idea that I could keep it in mind, and even put it up on my white board above my desk. 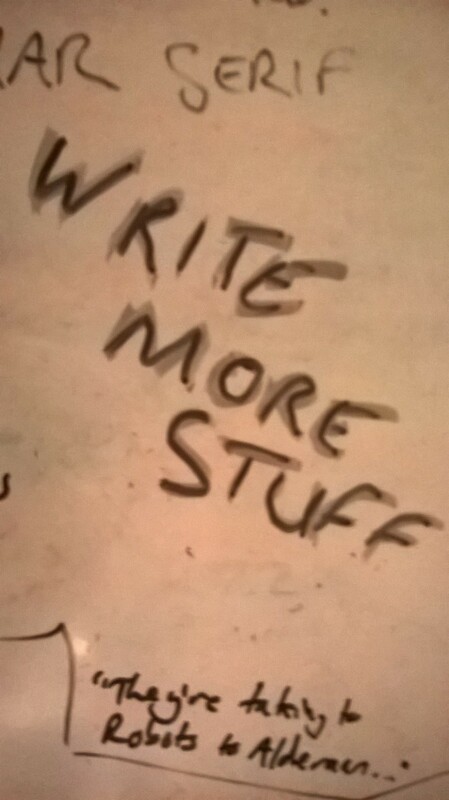 “Write more stuff” translates easily into whatever project I feel like doing, and as long as there is more stuff at the end of the year, then it’s working. That’s a measurable goal, that is. And last year I produced more plays, a new ebook and a lot of sketches. I found that the break of fifteen minutes at work is just long enough to eat a sandwich and write a page and a half of sketch, resulting in a sketch every week. That’s a sketch each week written at work, plus the stuff I can write when I’m at home. Like every published writer is fond of saying, there IS time to write, you just have to choose to use it for writing. Like last year, most of what I plan to complete and publish won’t reach the marketplace until the later half of the year, so I’m not going to list my projects here. I will post about them when they’re complete, and then put up reminders with links when they get published. I’m hoping the Appraisal Service continues to keep me busy, and that life at the Library remains as fulfilling and entertaining as it had proven so far. What are the big projects for YOU this 2015? Are you going to write that novel or sequel? Are you going to try writing something that’s outside your comfort zone, like a romance, or a horror story, or a poem? Are you thinking of writing for the first time? Because I have a really good feeling about this year. I think it’s YOUR year. I mean, obviously that’s bad news for everyone else, but we’ll cope, honest. Don’t feel bad for us, you just go on and make the most of it. We’ll be over here. In the corner. Maybe crying just a little bit. This entry was posted in Writing and tagged Damian Trasler, how to write, New Year, novel, Omar Serif, resolutions, white board, write more stuff, writer, writing, Writing success. Bookmark the permalink.